6'2 rounded square rolled deck wide point fwd. Making me want to try an MR Super Twin. rounded square is the key to those boards imo. With that tail - they do feel twinnish. Ditto, last one pinnie tail and refined was direct more quad like, better in faster cleaner waves where I'd prob take out something different. Yeah mines got a round tail, would love to try a rounded square, sounds like it loosens it up a bit beautifully. However saying that, get mine in sucky waves and the thing sticks nearly any take off, like a razor blade digging in. Drailed wrote: Yeah mines got a round tail, would love to try a rounded square, sounds like it loosens it up a bit beautifully. Yeah - mine had that feeling too, but i still wanted that loose feeling in all-round conditions and it couldn't do that. Round square is a great daily driver option. I'd order one again, but not sure i could go through the wait and order process. So since getting the RTT I thought I would take the Pavel out for one final run before I sold it. Only went and clicked with it and now cant bring myself to part, its actually one of my fave boards at the minute... so so nice. Cant believe how it didnt work for me before. 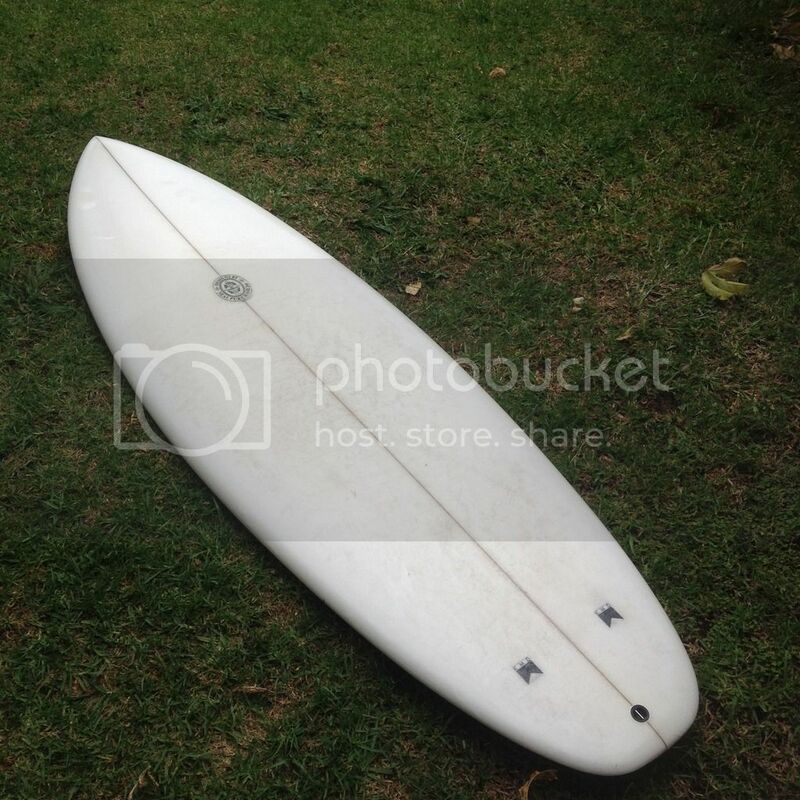 Def room in the quiver for two twins though, besides its a completely different board to the RTT. I just picked up and rode a really different board in really shithouse waves today. A PB Bonzer, really different, Epoxy so you can basically lift it with you little finger and a little twitchy in the slop, concave deck so its only 2 inches thick, a bunch of other things going on and didn't have the right fin in and it was 2 far forward for sure. I can tell I like the design but the whole Epoxy trip is a spin out, its the first time i have ridden one and was sitting on the board with water lapping my chin, but no probs getting into waves, weird. Anyway reckon its going to take a whole bunch of fiddle arsing around with fins and positioning and some kooky pain to get it dialed.....but I reckon it will be worth the investment. I'm finding that with my new Bonzer which is weird for a Bonzer, I think it has quite a bit more rocker than my usual boards and its only 2 inch in volume due to the concave in the deck (haven't checked rocker properly) so the thing turns on a dime and wants to always move somewhere and anywhere quickly but not in a straight line, so different to anything I've ridden. I rode it yesterday for an hour and enjoyed the difference then jumped on to my daily driver I had been taking for granted and surfed the best I had for months, hence good to try new things to brighten up your surfing. A mate up in qld had a quartet. Surfed with him in some sprinty two footers at Tugun a couple of years ago. It looked pretty damned quick down the line. As you'd expect from a low rockered twinzer. i'll post a review after a few more sessions. Ok so I’ve ridden a few NPJ boards over the last four years or so. They have similar characteristics – all boards are fast and flow really nicely. I still own the squail and 2+1. Now the Duo. 5’6, 20 ¼, 2 ¼ - flat deck. It has a few differences to the other boards. Firstly, the deck isn’t as flat as my squail. All the foam is neatly tucked under the chest – so it paddles well, even if the rails are thin, but the deck itself does looked rolled – and the rails aren’t blocky. It is actually really thinned out in the nose and the tail compared the other ones I’ve owned. And the nose is actually fairly point and not beaked at all. This board was shaped for Tommy and perhaps he asked for this – or it’s what NPJ is now doing with these – either way, the board, under the arm, feels great – really foiled out. The tail is rounded square and is about 16 inches wide. 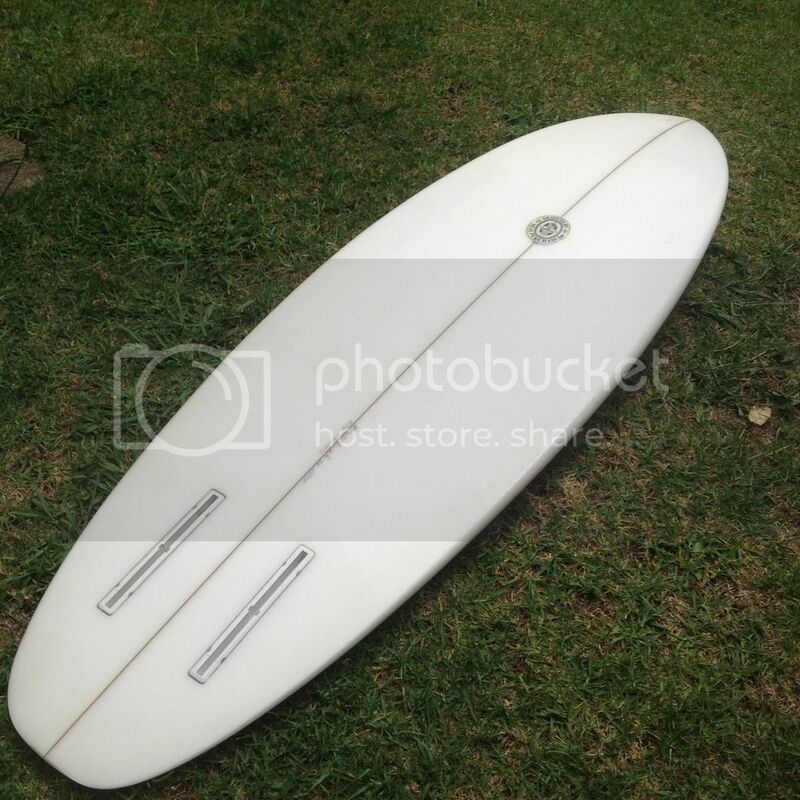 Although the board is short and wide, I don’t think it interferes with the performance characteristics. I rode this board over the last week – from well overhead to about chest high – across dredging beachies, a point break, a reef and your run of the mill beachie. The ride characteristics are quite unique. I can’t think of any other board that feels like this – and I’ve ridden a lot of different designs over the last ten years. The thing I noticed straight away was the acceleration. As soon as you are up, the board gets going. It has the twin fin speed from the get go, but the ride itself is quite different. You can find a highline, single fin style, or you can surf in the pocket and attack the lip. The word ‘snakey’ has been used to describe the board and I would agree. You feel the need to constantly move with the board, gliding, turning and pivoting. It has a much better turning radius than the quartet and is much faster than the mote single. Like most of NPJ’s boards, I think it’s best ridden with a narrow stance, but in this case, you don’t want your feet over the fins directly, as I found you tend to overpower the board – not slide out, just kook out. There is absolutely no tracking. The second quartet I owned felt tracky at times and over finned with its rounded pin like tail. The Duo doesn’t feel over finned at all and it has two big 7 inch fins in the back – but it also has a nice wide rounded square tail, so the board will jam out a hard turn, or wip into a cutback with ease. Backhand has been interesting. I’m a crap backhand rider. My usual MO is to drop into a bottom turn and attack the lip. The duo has no problems with this approach and in fact it feels great pushing the tail hard in the bottom turn – no sliding out – which bonzers can do without the proper fin setup. The strange thing is, usually at the lip I just twist my body and throw the tail – however, the duo needs another effort after your body twist – almost like digging in your foot and it really gives out a huge spray. Interestingly, the duo is what I imagined a single fin would feel like. I’ve ridden a few and have never been able to get them to work well. But jumping on this felt natural straight away, I didn’t even really need to adjust too much. That said, I ride bonzers and fishy quads, so maybe if you were coming off thrusters, then you would hate it, or would need to spend some time working through the narrows stance, forward ride and snake-like glide. How does it compare to the quartet? It feels better through turns – very tight turning radius and it doesn’t lose speed. It’s hard to compare drive at the moment, because I haven’t ridden it in everything. Same glide, similar speed, different feeling of control – loose, but not out of control. At times for me, my most recent quartet was silly fast in good waves, whereas the duo (and my older quartet) seemed to be in tune with the wave and find the right line quickly and efficiently. Better than a single – but that’s just my opinion. There are many who can get heaps out of a single fin. Bonzers? Very different feel and of course bonzers have different fin set ups and plan shapes so this is only based on the five I’ve ridden. When a bonzer hits fifth gear, they levitate and feel like they are above the wave. These pockets of acceleration need to be found and used – usually from the bottom turn to the high line, whereas the duo seems to speed up right from the get go – you don’t need rider input. Bonzers don’t lose speed through turns and the duo feels like this too. Bonzers feel absolutely connected to the wave, in a good way. The duo feels skatey and snakey, but not out of control, especially if your feet are slightly forward – it glides and swoops with absolute clarity. Bonzers require fin tweaking over multiple sessions. The duo feels just right to me at 7 inches – I don’t think I will tweak at all. How does it compare to a quad? Depends on the quad… my CV2 is really fast – the duo compares, but lots of boards I’ve ridden in the last five years have been really fast. All the tomos I’ve ridden have been insanely fast. The duo has better tail release, but the CV2 has more projection out of the bottom turn. The duo feels better through cutbacks, but the CV2 has better pop in snaps. Horses for courses here. CV2 is fishy performance. Duo is single, hybrid glidey performance. Sadly, the board is in average condition. This is the peril of the internet purchase…the pics look good, till you get it…it has dings galore, a crappy repair on the nose and cracks and foot wells everywhere. I think this board is glassed lightly and maybe that’s what Tommy asked for – it is light, but I’ve already added to a few of the bumps, which means the board won’t last a year and will likely end up like my favourite stringerless quartet which was snapped within 12 months of owning it. That board was a second hander too, and in worse condition, so maybe I’ll get 18 months out of the duo, which would be nice. This board is not worth what I paid for it, but if it does end up broken, I would definitely look into getting another duo. It is a unique ride – fast, fun, loose, glidey, but has some really strong performance at the lip and in the finish of the wave. I made a solid backhand barrel that other boards wouldn’t have out at the point over the weekend. Duo = two fins up.